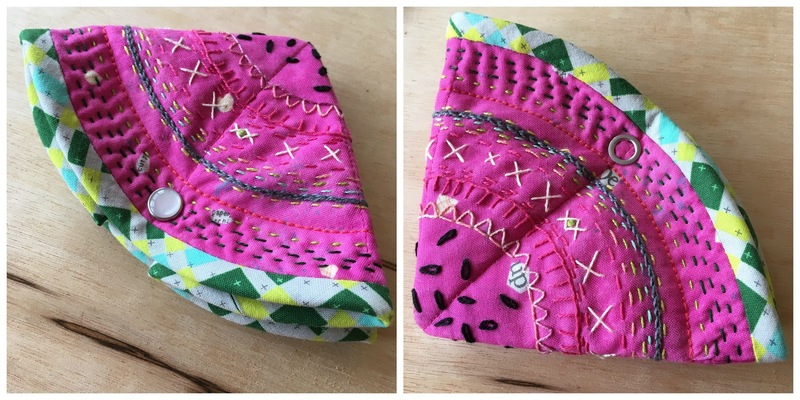 This is the watermelon version of my Stitchy Pie needle case. 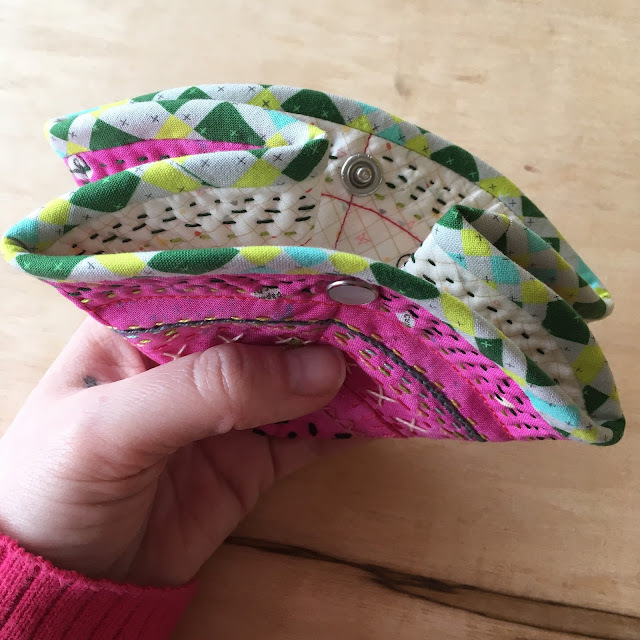 It is the most useful needle case, it helps me organise all my hand sewing needles in a cute way and is perfect for using up scraps! 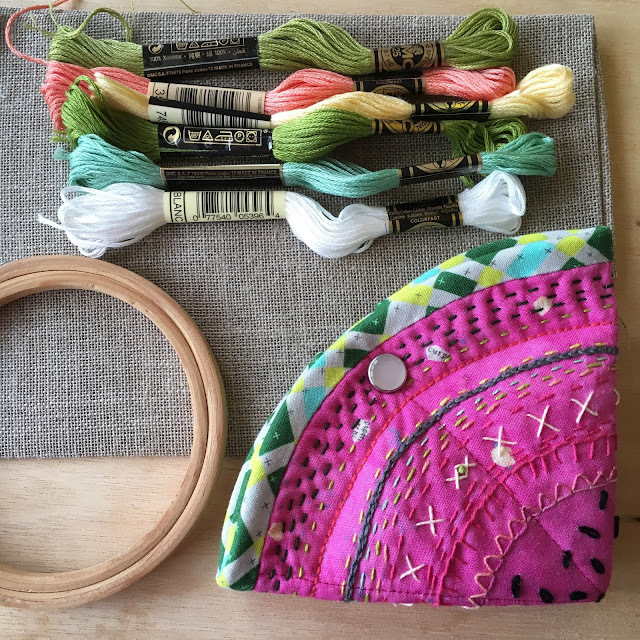 I teach this as a class but am contemplating making the pattern available for sale, let me know in a comment if you would be interested. **UPDATE! The pattern is now available to buy, click here or visit my Etsy shop. I did some of the same stitches as the original, added some new ones and a few rows of hand quilting. I also used a popper because I think that is easier to open (the magnet was too strong, a weak one would work though). I am forever mixing up my needles I could definitely do with one of these! Love it! I for sure would buy this cute pattern! It is a lovely pattern. I especially like the fact that all the needles are on view at the same time. Eek COOL video, Lucy!! And so super cute. You are genius. It's beautiful and very useful. I vote yes for doing a pattern and instructions. I love the outside stitching. I would love a pattern for this. What a great idea for storing your needles! I would love a pattern! This is the perfect little make for guild swaps and the perfect gift for the sewists in our lives. I love this - it is so clever, surely any quilter needs one? Yes, please. 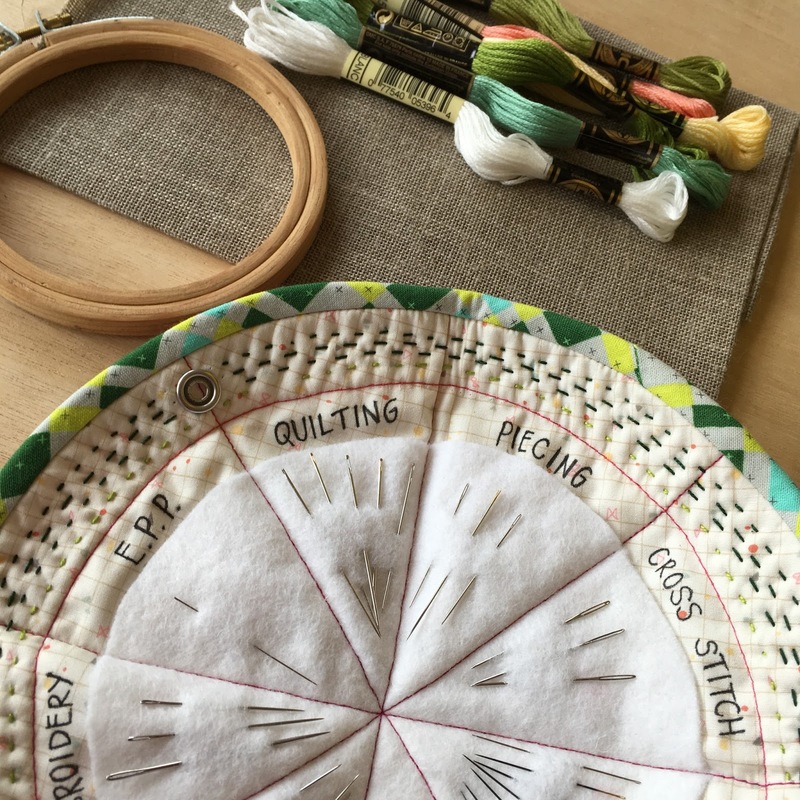 I love the idea of sections for each type of needle! It looks awesome and I love the watermelon look - so cute! If it were available RIGHT NOW I'd definitely buy it because I'm working on stuff for a swap and it'd be a great addition. And if it were available later, I might still buy it because it's pretty awesome. A pattern would be wonderful. Awesome gift idea for your friends who do needle crafts. I would like the pattern because I have been contemplating just making one up! Very cute. I would buy the pattern! This is adorable! Brilliant AND adorable - this would make a fantastic pattern! I've never heard them called "poppers" - such a great word! I love the way all the needles are tucked safely away, with all the points in the the centre! I often get 'pricked' when using a regular needle book! It's clever AND adorable. Very well done. I think you'd be very successful with a pattern!